Begun in 2005, Pandea and Soylent Green is the project of singer, songwriter, and guitarist Dan Uhden (Merlin, Mind Odyssey, Dark Voices). Mr. Uhden brought fellow metal folk from Germany, many from the former DDR, with 16 musicians collaborating on the work. The album is a concept work based loosely on the 1974 film Soylent Green (which was loosely based on Harry Harrison's sci-fi novel Make Room! Make Room!). In the film, Charlton Heston's detective character, Robert Thorn, investigates a criminal conspiracy concerning the human ingredient of soylent green against the background of a dystopian future. Unlike the film, Uhden's Soylent Green seems to be more concerned with horrors of that dystopian future including overpopulation, environmental degradation, and a dwindling food supply. However, as best as I can tell without the lyrics sheet, Uhden's work may also include references to Detective Thorn. The music, however, is pure melodic heavy power metal, a perfect medium for an epic sci-fi story. Imagine Gamma Ray meets Savatage with a possible dose of Queensryche. A premium has been put on composition as the songs offer power and heaviness over landscapes of melody and grandeur. A variety of vocalists, including Uhden, allows for versatile dynamic of smooth to harsh melodic metal tones. In the end, however, the music most impressed me: solid melodic metal, plain and simple, with lots of great guitar solos and vocal arrangements. Right up my alley! Highlights would include Lost Eternity, Point of No Return, Eden Again, and Flesh and Light. Very recommended. 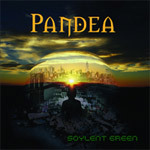 Dan Uhden's Pandea project Soylent Green is genuine melodic heavy and power metal. It's a grand and entertaining canvas for Uhden's interpretation of the classic sci-fi film.